When it comes to speakers, I’ve always lived by two rules. First, get them as big as necessary, and this comes from simple physics; speakers need to move air to make sound. You needed at least a certain size to get a decent sound from speakers. There’s much more to make a great speaker, and size alone won’t take care of it, but we’re talking simple rules. Second, is buy vintage, because while there are plenty of new speakers on the market that are great there are tons of vintage speakers that are economical that provide the sound, clarity, and volume that you want. The Audience ClairAudient “The ONE” speakers are a refreshing rebuke of my overly simple rules for speaker acquisition. Priced at $995 these definitely go against one of my reasoning for buying vintage, thriftiness, but these are definitely worth every dollar. The ONE are small, deceptively small, and when I unpacked them I was very suspect that these speakers would be up to the task. 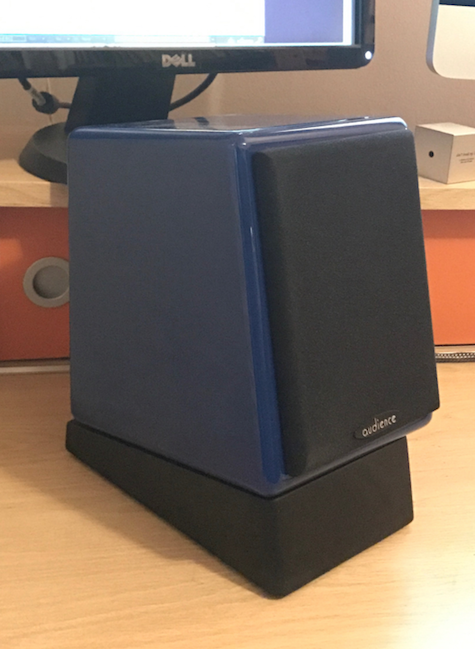 Measuring at 7” tall, 7” deep, and 5.5″ wide, these put the bookshelf in bookshelf speakers, but looks are incredibly deceiving. 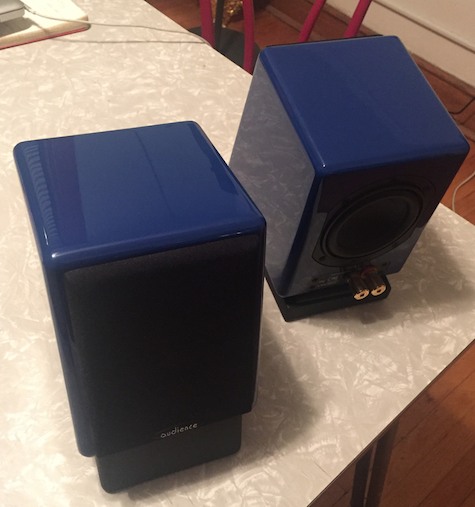 My test pair came in a high gloss blue, which may be a little too flashy for some, it also comes in in glossy black. 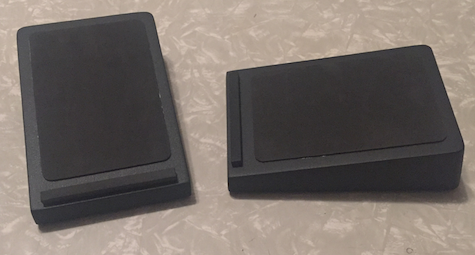 The pair also came with a set of desk stand, and these stands are extremely important if using on a desktop/tabletop, because as far as positioning is concerned, these make a huge improvement. 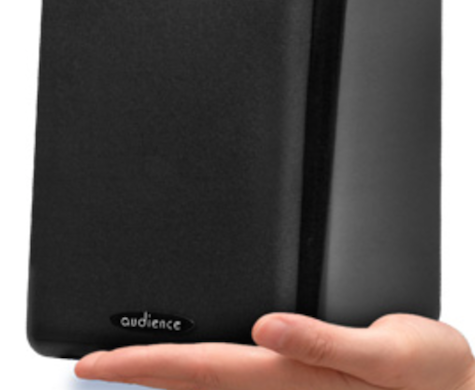 The output is just one 3” titanium alloy driver with a 4” passive radiator on the back. They weigh each about 4 pounds, and while again the lightness is very deceptive, they are well constructed and feel incredibly sturdy in hand. Audience labels these as personal reference monitors, so I used them with my desktop computer in my office. This also allowed me to test these in just about every scenario; gaming, movies, and music both digital and analog. So what is the verdict? These speakers are incredible, the reproduction is beyond phenomenal, and clarity is so good it’s a little disorienting. Why disorienting? I think that has to do with listening through speakers that boost different frequencies to compensate for lesser quality and natural tendencies to boost low end. I’ve never understood the concept of speaker burn-in until these speakers, mostly because all my speakers have been way burned in by the time I purchased them. After a few days of playback the sound really began to warm up and started to begin to create an enveloped space. Listening to Beethoven’s Piano Sonata #32 In C Minor, Op. 111 is just pure bliss, and this is where these speakers just shine, as you just get lost in the performance. Putting on Cracked Actor from the David Bowie David Live LP was also a joy. The placement position was a little close as far spacing but with the stands the direction was right at my head and the separation was great. The spacing and depth worked extremely well with involved sound design like with Oneohtrix Point Never’s Boring Angel. Things didn’t work out so well for me with some other things. Solange’s Cranes in the Sky and Tinahse’s Company had a crispiness that I wasn’t into. This is the one complaint I have about the ONE speakers, that the bass response is a little thin and the over all output is less than what I’m used to. With certain recordings I think that clarity begins to become a detriment instead of an asset. I spent a lazy Sunday replaying Bioshock and here the speakers shined again. That clarity and soundstage creation really helps bring the game to life. I watched Captain America: Winter Soldier with these and again that precision and range make movie watching a fantastic and engrossing experience. 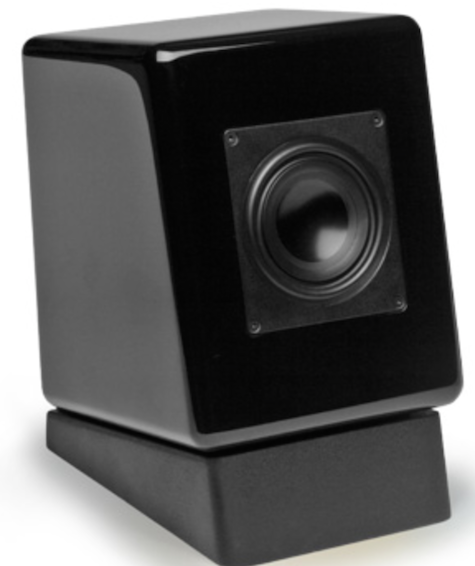 These are small speakers and aren’t really going to be your party speakers. While incredibly clear theu aren’t very loud and aren’t going to push a lot volume, and at the price you probably wouldn’t want to potentially damage them trying to rock out. 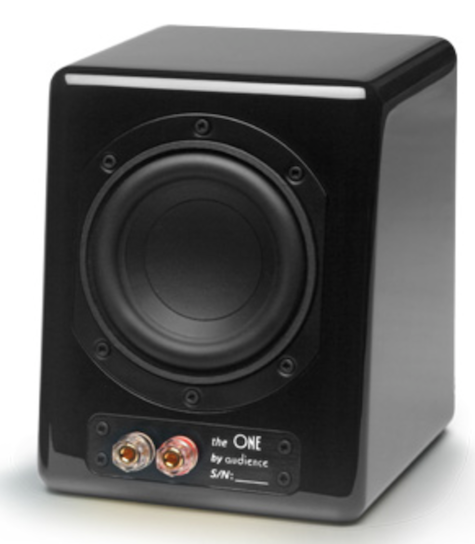 The ONE speakers by Audience are extraordinary speakers/monitors that are perfect for an office or a small home theater. They have challenged my notions about speaker performance for the better. MyMac Review Rating is 9 out of 10 when cost is not a factor.